The Eurasian curlew (Numenius arquata) belongs to the family of sandpipers and curlews, the Scolopacidae. The Eurasian curlew species is distributed in Europe, Mediterranean region, Africa, Indian continent and southeast Asia. These curlew species are mostly migratory birds. These curlews are polytypic species. The Eurasian curlew (Numenius arquata) is a large curlew, measuring 50 to 60 cm in length and weighing 400 to 1350 grams. The wingspan is 80 to 100 cm. The overall plumage of the Eurasian curlew is grayish brown. Much of the body bears striped pattern. The head and the underparts are a little paler. The back and rump are white. The tail is white with dark bars. The bill is long and curved. The irises are blackish. The legs and feet are bluish gray. In flight, the toes extend beyond the tail. The call of these curlew species is a loud rich, ringing "courli ..courli ..courli" or "kiick ..kiick ..kiick" sound. The breeding populations of the Eurasian curlew are distributed in the United Kingdom, north-western Europe, Scandinavia, Russia, Kazakhstan, northern Mongolia and northeast China. The wintering populations of the Eurasian curlew are distributed around the coasts of north-west Europe, the Mediterranean region, Africa, the Middle East, the Indian subcontinent, southeast Asia, southeast China, Taiwan, Japan and South Korea. In India, wintering Eurasian curlews are distributed in the states of Gujarat, Maharashtra, Goa, Karnataka, Kerala, Tamil Nadu, Andhra Pradesh, Odisha, West Bengal, Tripura, Mizoram, Jammu and Kashmir and Punjab. Vagrant Eurasian curlews have been observed in USA, Canada, Jan Mayen Islands (Norway), Greenland (Denmark), New Zealand, Lesotho, Central African Republic, Cape Verde, Bermuda (UK) and Bahamas. 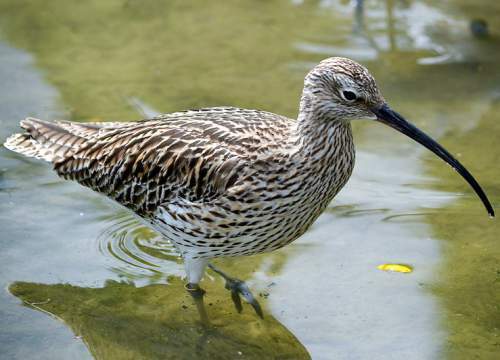 The Important Bird and Biodiversity Areas (IBA) of the Eurasian curlew species in China are, Shuangtai Estuary, Inner Gulf of Liaodong, Yalu Jiang Estuary and Wenzhou Wan. The IBA in Malaysia are, Matang coast, Sadong-Saribas coast and North-central Selangor coast. The IBA of the Eurasian curlew species in Iran are, Khor Jask, Shadegan marshes, tidal mudflats of Khor-al Amaya and Khor Musa, Khouran Straits, Miankaleh Peninsula, Gorgan Bay, Rud-i-Shur, Rud-i-Shirin and Rud-i-Minab deltas and Rud-i-Gaz and Rud-i-Hara deltas. These Eurasian curlew species have low forest dependence. They normally occur in altitudes from 0 to 100 meters. The artificial ecosystems and habitats of these species include, flooded agricultural lands, cultivated lands and pasturelands. 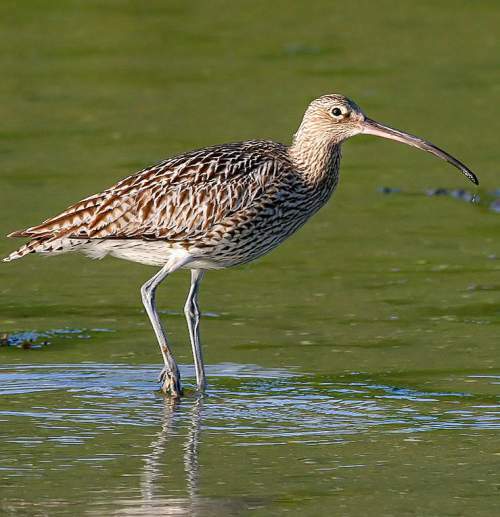 The natural ecosystems and habitats of these Eurasian curlew species include, temperate grasslands, temperate shrublands, mangrove forests, flooded grasslands, coastal marine lakes, intertidal mudflats, marshes, lagoons, estuaries and freshwater Lakes. The diet of this Eurasian curlew consists mainly of insects and worms. Polychaete worms, earthworms, molluscs, crustaceans, spiders, grasshoppers, crickets, locust, cicadas, small fish, amphibians, lizards, nestlings and small rodents are their primary food. These Eurasian curlews forage in shallow, submerged land by probing mud with their long sensitive bill. They can catch small fish and amphibians in water. They also pick invertebrates and small vertebrates off the dry ground. The breeding season of these Eurasian curlew species is from April to July in most of their breeding grounds. They are monogamous and territorial. The male defends the territory by embarking on undulating display flight. The Eurasian curlew nesting sites include, upland moors, taiga, dry heathlands, open grassy areas in forests, damp grasslands and coastal marshlands.The nest is a shallow scrape on dry open ground or in the cover of grass or sedge. The Eurasian curlew clutch contains three to six buff colored eggs with brown blotches. Both the parents incubate the eggs and raise the young. The chicks hatch out after 30 days of incubation. These Eurasian curlew species are mostly migratory birds. The breeding populations are distributed in United Kingdom, north-western Europe, Scandinavia, Russia, Kazakhstan, northern Mongolia and northeast China. These curlews migrate southwards to the wintering range between July and November. The juveniles leave one month after the adults. The return migration to the breeding grounds takes place between February and May. Non-breeding Eurasian curlews may remain on the wintering grounds all-year-round. Some populations in Ireland, United Kingdom, Netherlands and Germany are native resident breeders. The global population size of the Eurasian curlew (Numenius arquata) is estimated at 835,000 to 1,310,000 individual birds. The overall population trend of the species is considered to be declining. In most of its range, this species is reported to be common to rare. The generation length is 5 years. Its distribution size is about 20,700,000 sq.km. Habitat alteration and destruction, deforestation, climate change, severe weather, pollution and capture of adults and juveniles as pets and display animals are the main threats that are endangering the survival of these curlew species. The Eurasian curlew (Numenius arquata) is approaching the thresholds for being Vulnerable, under the range size criterion, under the population trend criterion and under the population size criterion. 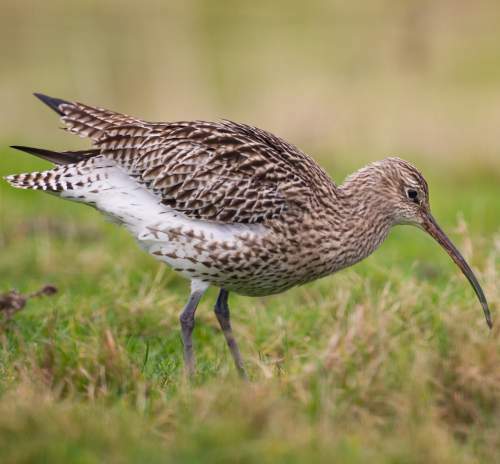 The IUCN (International Union for Conservation of Nature) has categorized and evaluated the curlew species and has listed it as "Near Threatened". The CITES (Convention on International Trade in Endangered Species of Wild Fauna and Flora) status is ‘Not Evaluated’ for Eurasian curlew (Numenius arquata). The three recognized subspecies of the Eurasian curlew (Numenius arquata) are: Numenius arquata arquata (Linnaeus, 1758), Numenius arquata suschkini Neumann, 1929 and Numenius arquata orientalis C. L. Brehm, 1831. Current topic in : Eurasian curlew - Numenius arquata.